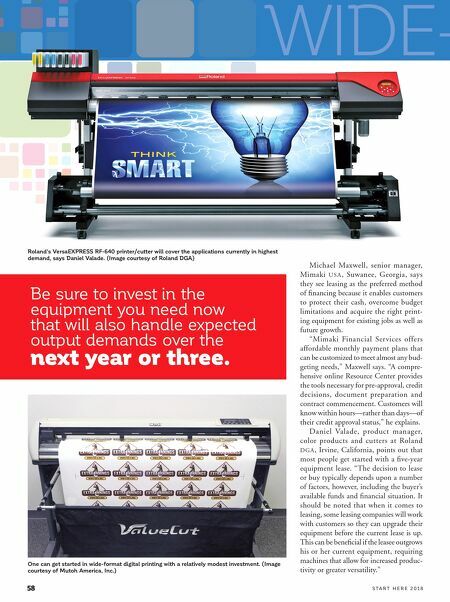 58 S T A R T H E R E 2 0 1 8 Michael Maxwell, senior manager, Mimaki U S A , Suwanee, Georgia, says they see leasing as the preferred method of financing because it enables customers to protect their cash, overcome budget limitations and acquire the right print- ing equipment for existing jobs as well as future growth. "Mimaki Financial Services offers affordable monthly payment plans that can be customized to meet almost any bud- geting needs," Maxwell says. "A compre- hensive online Resource Center provides the tools necessary for pre-approval, credit decisions, document preparation and contract commencement. Customers will know within hours—rather than days—of their credit approval status," he explains. Daniel Valade, product manager, color products and cutters at Roland DGA, Irvine, California, points out that most people get started with a five-year equipment lease. "The decision to lease or buy typically depends upon a number of factors, however, including the buyer's available funds and financial situation. It should be noted that when it comes to leasing, some leasing companies will work with customers so they can upgrade their equipment before the current lease is up. This can be beneficial if the leasee outgrows his or her current equipment, requiring machines that allow for increased produc- tivity or greater versatility." Roland's VersaEXPRESS RF-640 printer/cutter will cover the applications currently in highest demand, says Daniel Valade. (Image courtesy of Roland DGA) One can get started in wide-format digital printing with a relatively modest investment. 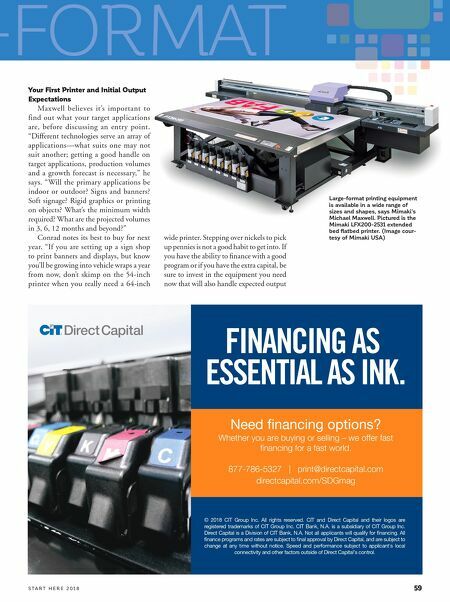 (Image courtesy of Mutoh America, Inc.) WIDE-FORMAT Be sure to invest in the equipment you need now that will also handle expected output demands over the next year or three.